Laurence Llewelyn-Bowen is the latest in a long line of celebrities to take a seat in a Watsonian sidecar. 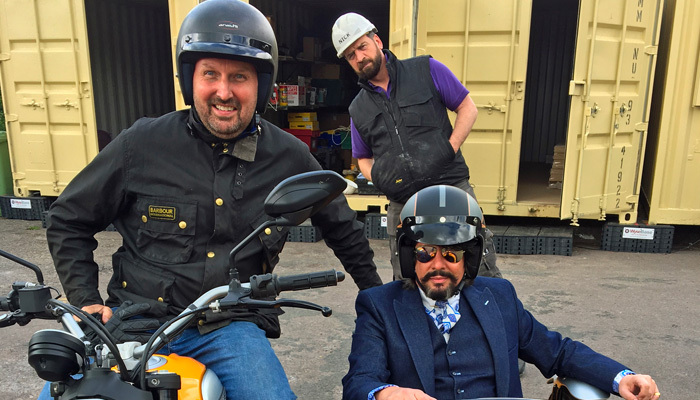 The interior designer arrived at a building site in Gloucestershire in a Ducati Scrambler/Watsonian Manx outfit during filming for DIY SOS: The Big Build. The prime time television programme, now in its 28th series, is broadcast on BBC1 and this episode is due to appear early next year. Watsonian Sidecars celebrate their 105th anniversary this year and are often called upon to provide transport for filming; last year Penelope Keith – star of The Good Life and To The Manor Born – took a trip in a Watsonian Grand Prix for her Hidden Villages series on Channel Four and in 2014 Ant & Dec drove a Watsonian outfit in the trailer for Britain’s Got Talent. Watsonian also supplied the sidecar outfits that appeared in Harry Potter and the Deathly Hallows. Demand for sidecars has increased significantly this year and the Cotswold factory is running close to capacity, fulfilling orders from domestic and overseas customers.